Bastia is a busy town with a population of 50,000, making it the second largest town on the island. Whilst we don't have any properties in Bastia itself, we do have several excellent villas in the surrounding area. The Place St Nicolas is a pleasant spot to soak up Bastia's Mediterranean atmosphere and with its shady trees and cafés, is the social hub of the town. The Boulevard Paoli and Rue César Campinchi are the the main shopping streets running parallel to the square. The old town lies south of Place St Nicolas and surrounds the Old Port of Bastia which should not be missed. It is overlooked by the honey coloured Citadel and bustles with harbour side bars and restaurants. Wander through the old streets behind the old port to find the Place du Marché where there is a local farmers market each morning. South of Bastia is the Castagniccia region, a huge forest of chestnut trees dotted with small villages, walking trails and increasingly renowned for its traditional cuisine. Sited between the mountains and sea, the Costa Verde boasts a 17km stretch of golden sand with Moriani Plage as its main resort. Staying in the city itself is a great option, and our latest Bastia hotel, Hôtel des Gouverneurs, is a great option for those after a stay in boutique hotel. 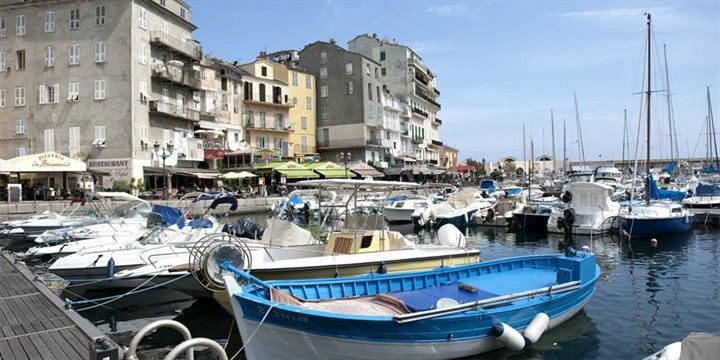 Wander through the streets of Bastia's old town and discover an area rich in architecture and vibrant with harbour side bars and restaurants. Sample local produce from the farmers' stalls on Place du marché or have lunch on the Vieux Port. Explore the Castagniccia (literally meaning “small chestnut grove”), wherein lies over 100km² of primarily sweet chestnut forests. Many of the Sanglier (wild boar) that are eaten on the island each year are caught in this area, but, despite this, many of the villages in the area now lie abandoned – albeit now providing an interesting route for ramblers. On a clear day, the altitude affords views over the Tuscan Islands, occasionally, the snow-capped peaks of the Alps are discernable. The highest peak in this region, Monte San Petrone (1,767m) presents a challenging hike, but the view from the top, both out towards Italy and back into the Casaluna valley are well worth the effort. Visit the Etang de Biguglia south of Bastia, the largest lagoon on the island and a haven for migrating birds. More than 100 species can be observed here, whilst the beach of la Marana provides a great spot for a relaxing afternoon.